Fight the dead, fear the living! Do as the leash commands. 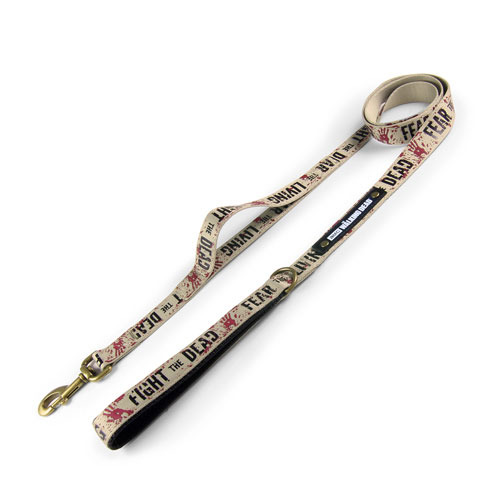 Luckily in today's civilized society, there's not a lot of dead things lumbering about that you have to fight, so you're pretty safe on that end if you want to take your dog for a walk with The Walking Dead Fight the Dead Fear the Living Dog Leash! If you're worried about the other side of the quote on the leash, "Fear the Living," then you probably have agoraphobia. In any case, this dog leash is perfect for taking your own little bit of walker bait on a stroll through the neighborhood. Leash measures 5-feet long.